Alan (not a Blueprint Owner YET, but is on a PowerOptions Trial) was following our webinars in December. He watched on December 20th when I adjusted the put option on the Starbucks (SBUX) RadioActive Trade in the Fusion portfolio. 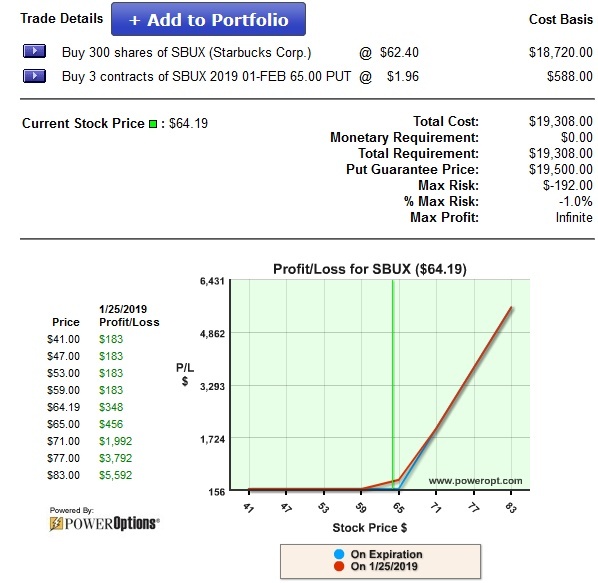 Alan DID NOT open a RadioActive Trade on SBUX, but he did purchase a few hundred shares after the webinar for a cost of around $62.40. 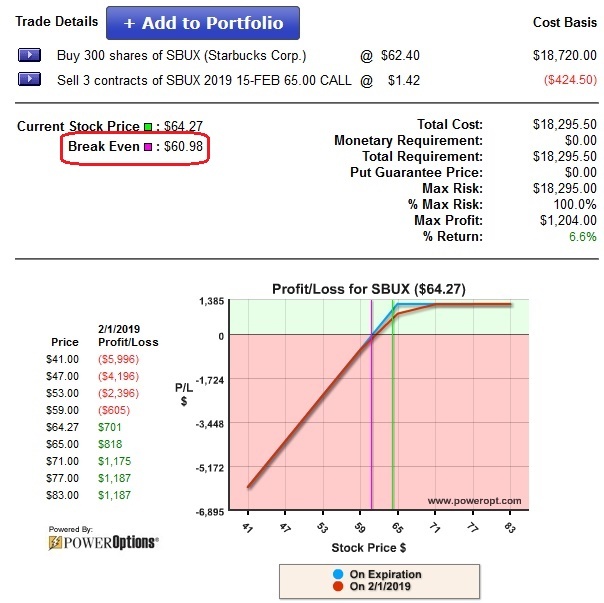 SBUX is trading around $64.20, and Alan has an unrealized gain of +$1.80, or +2.9%. Not too shabby. Well, selling half of the shares would take in some profit – but there would still be a lot of downside exposure going into earnings . But what if it falls -5%? -10%? -20% due to a poor earnings? Now we are below the Break Even of $60.98 and at a loss. This would not lock in gains. Nor would it leave the Upside Open. Just selling a call, converting to a Covered Call, is not the best way to Lock in Gains. Since Alan is on a trial to PowerOptions I directed him to our Insurance Tool. 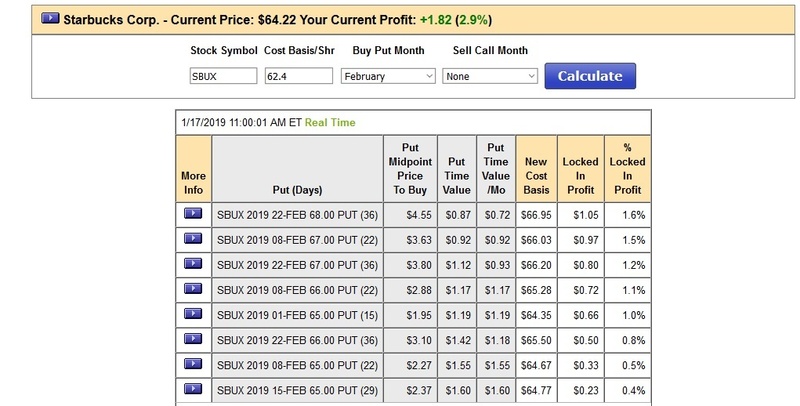 This simple, but powerful tool will show a better way to lock in gains on your stock, have no fear through earnings (or any other unexpected event) AND leave the upside open. We simply input Alan’s situation. And BAM! In an instant he saw various opportunities to Guarantee a gain on his stock, while still leaving the upside open. Rather than capping the gain and leaving the downside exposed, which could turn a winner into a loser, he could pay just a portion of the unrealized gain to Guarantee a profit if the stock collapses, while leaving the upside open for further gains if SBUX gaps up! AND, there are other techniques discussed in The Blueprint where he could generate income, lower the cost basis, and still leave the upside open! If you would like to see how you could Lock in Gains and Smile Through Earnings, check out our archived video HERE. 3. AND Leave your upside open! You will also see tools to help you complete your own Hat-Trick on your stocks, as well as another technique to profit in both directions through earnings without any risk! Click HERE to watch Lock in Gains; Smile Through Earnings! Head over to www.poweropt.com and register for a 14-Day Free Trial. You will have access to the Insurance tool (not to mention dozens of other patented options research and analysis tools) to see how you can best Lock in Gains on your stocks, while still taking advantage of positive moves.